Growing up the only girl among five brothers in her family didn’t stop Rhapsody Canepa from embracing her God-given femininity. Canepa volunteered in church efforts with her mom throughout childhood and by the time she was a young adult, Canepa’s giving spirit visually stood out. She found herself the youngest alumna serving on St. Vincent de Paul’s school board — alongside a friend and fellow classmate. Not much later, she became the the youngest regular member of the Phoenix Diocesan Council of Catholic Women. The group regularly meets for fellowship and inspiration in the faith and bestows several “Woman of the Year” awards annually. The PDCCW also coordinates the annual diocesan Catholic Women’s Conference, which is now in its seventh year. Canepa led the first one and has served on a planning team ever since. The Feb. 18 conference, themed “Perhaps you were born for a time such as this,” at Xavier College Preparatory, will be her last women’s conference in a leadership role. Canepa plans to finish her fourth year as PDCCW president in June and then step back to discern a parish ministry. Years of supporting a local Catholic singles group and then Cursillo hasn’t afforded her the time to truly become active in parish ministry. The St. Joan of Arc parishioner is eager to get involved where her husband, Nick, is already part of the Knights of Columbus. As adoptive parents since 2013, the Canepas are eager to better model active parish life, especially as their 8-year-old son approaches a more complete sacramental life. “When we grew up, our parish was always our other home. I want Zeke to feel the same way spiritually and in ministry,” Canepa said. That’s the similar vision Bishop Thomas J. Olmsted instilled in the women who pioneered the first diocesan Catholic women’s conference. “The purpose was for them to continue to grow in their faith and to have fellowship with one another,” Canepa said. She has watched in awe as the guest speakers appear to be even stronger in their faith each year and in their knowledge of Church teachings. This year’s guests include Sr. Mary Jordan Hoover, OP, who is paving the way for the West Valley’s first Catholic high school and will serve as its principal, plus Marge Fenelon, an award-winning author, journalist and blogger. Monica Gatlin and Beth Davis, a youth minister in Flagstaff, will also share their stories. Canepa is among a core of 18-20 women on this year’s conference committee. She praised the leadership style of Roberta Bazaldua, the current vice president who oversees the conference. “We also make time to pray together and share together so we’re a really cohesive team. It makes working together much easier,” Canepa said. That sense of fellowship and sisterhood in Christ transfers to conference-goers. Canepa sees teens and young adults who come with their mothers and grandmothers and enjoy growing together. Others return to the sacrament of Reconciliation. Adding private Eucharistic Adoration last year was a big hit and will now be a women’s conference staple. It’s something Canepa herself grew to love as an adult and transferred her love for it to her parents. It was the least she could give back to a family that put her through Catholic elementary and high school in the diocese. Her devotion to St. Kateri Tekakwitha stems from her Gila River heritage on her dad’s side with the Blessed Mother receiving a lot of her praises and petitions lately too. 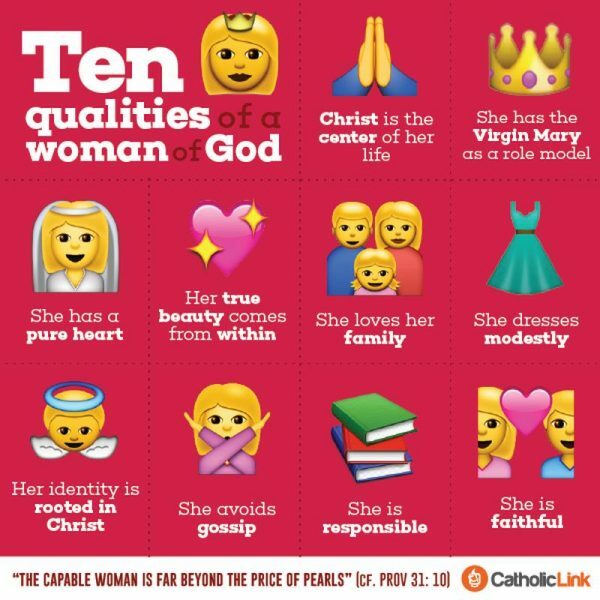 “As a mother, I’m, ‘Help me to be as good of a mother as you are,’” Canepa told The Catholic Sun shortly before heading to a monthly Rosary coordinated among friends and family. The fact that she got engaged on the mock Tepeyac Hill at Mount Claret Retreat Center, the same sacred space where she made her Cursillo the exact day her son was born, is not lost on Canepa. It warms her heart to see how much her son loves Mount Claret now. Sitting in front of the new Christ Child Shrine at Mount Claret, the Canepas reflected on their time with the PDCCW — Nick was affectionately called their mascot since he often helped behind the scenes. Nick said his wife knew the direction the PDCCW needed to go and took it there while still remaining faithful to the family. “It’s a godly, faith-filled movement. She’s become a better person for it and so have I and ultimately, we’ve influenced our son,” he said. The Canepas are working on re-opening their adoption license.